In this post author has covered following points that would provide you an overview on value stream mapping (VSM). Why VSM is important in process improvement? VSM is a tool that helps us grasp our current state of the process and identify improvement opportunities. It is a process of production planning. It is a language comprising of symbols shown in the following figure. Value stream thinking entails seeing the combination of processes required to bring the product to the customer. In its absence, departments might optimize measures in their zone without considering the impact on other areas or on the business. Value stream have the immense importance when it comes to on time delivery leading to customer satisfaction. Normally, textile or garment units work with department specific approach. This means that every department does its jobs and wants to achieve targets irrelevant of the problems which the subsequent departments face. Where to stock these fresh panels? How to complete the previous job? What about the pieces that go missing in this mess? And it becomes a chaotic situation. But the implementation of VSM creates a situation, an atmosphere for smooth work flow from one department to another department. The preceding and successive jobs will be planned such a way that there should not be any stoppages, no mess at all. The pictorial chart shown above gives us an idea of its working. 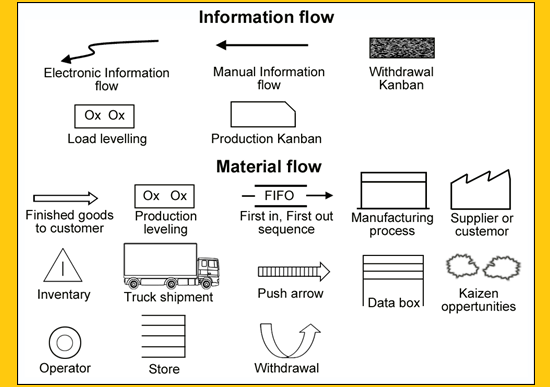 It details us about Information Flow and Material Flow such that no bottlenecks exist in the processes. The main advantage of VSM is it leaves a positive impact on the entire business set-up. This is possible because it makes it possible for all the departments to optimize functionally and serve the customer accordingly. Lean in principle is, identification of non value adding steps and eliminating them in all possibility. In the process it strives for value addition by reducing defects and wastes. There are 8 types of wastes that are already detailed in the introduction part itself. VSM is a powerful Lean tool, combines material flow and information flow on a map. In this the processes are mapped such that the whole Lean team visualizes and understands the processes and the sequential material/work flow. Make a family or a group based on product (product wise) or service (service wise). This means similar product suppliers or customers be considered as one family while drawing a VSM making it easy to visualize and understand. Create a current state map using various icons for VSM. ‘Go-see’ attitude is used rather than ‘hear-say’. This helps in updating the current state keeping in mind the customer point of view. The current state map acts as a foundation for future state map. When does he need it? What are the wastes and how to eliminate them? How to have work flow uninterrupted? How to deal with interruptions, if any? What process improvements required for value addition? Future stage- a possibility - As a result of the brainstorming sessions VSM team comes to this stage where it derives an ideal state for organization to arrive at the proposed future state. It is an implementation plan that includes all departments like Research & development, Finance, customer services etc., along with the main processes related to direct production. In the event it is required to practice Kaizen, to continuously achieve waste elimination and implement streamlined processes. Kaizen focuses on improving individual loops or departments like R & D, purchase etc by involving the process owners in its efforts. Here the problem is written down, detailed and described and is then analyzed as to why it occurred. Arrive at the root cause of the problem by repeatedly focusing on the problem and problem alone. Then finally rectification process is developed and sustaining it is prioritized. Hence VSM is a very powerful tool in value addition encouraging GO-See to satisfy customer in real sense. Value stream mapping an overview.